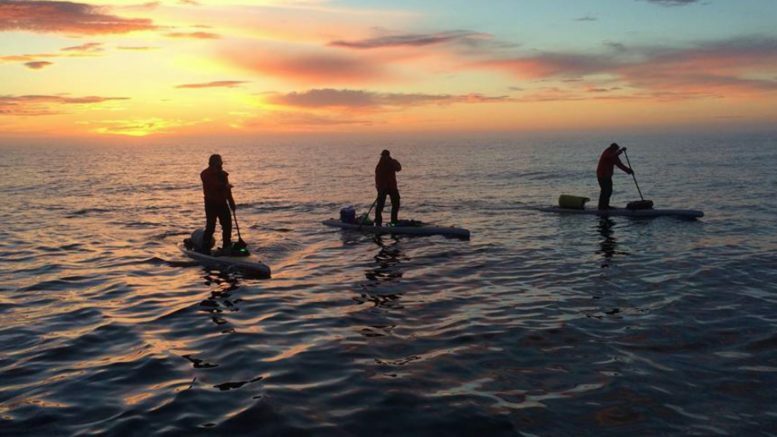 (Image Courtesy: Stand Up For Great Lakes) Kwin Morris, Joe Lorenz, and Jeff Guy paddling at sunrise across Lake Huron. Alpena — Three Michiganders plan to do what has never been done, cross Lake Superior on paddleboard. The three are Kwin Morris, Joe Lorenz, and Jeff Guy. So far, the crew has crossed Lake Michigan and Lake Huron, raising awareness and funding for different causes tied to the environment. For the latest adventure, the crew will look to raise $10,000 for the Great Lakes Shipwreck Historical Society. They will also honor those sailors who died in the shipwreck of the Edmund Fitzgerald. “By bringing in this important maritime history and honoring those sailors that went down with the Edmund Fitzgerald just adds another really important human element to their work,” said Maritime Archaeologist Stephanie Gandulla. Gandulla traveled with the crew when they crossed Lake Huron. She knows the dangers of paddling and navigating Lake Superior. In order to have a successful trip, the guys will look to leave between July 9 and July 20. Conditions will need to be perfect in order for the group to succeed. Each paddler will carry their own supplies. The entire trip should take between 24 to 32 hours.